The Madrona RainProof Collection by Classic Accessories keeps your patio furniture safe giving you peace of mind for years to come. Our RainProof fabric combines style and durability with taped seam construction to keep rain and weather out in all conditions.When you buy a Classic Accessories grill or patio furniture cover you are not just getting a cover; you're also purchasing peace of mind.Not only will your grill and patio furniture be protected from the elements, but you'll be protected with the easiest warranty in the industry. If your product fails within the warranty period, look for us online and take advantage of our Hassle-Free warranty program supported by our US-based customer service team. Features: Type: Cover. Color: Cocoa. Day Chaise Cover. 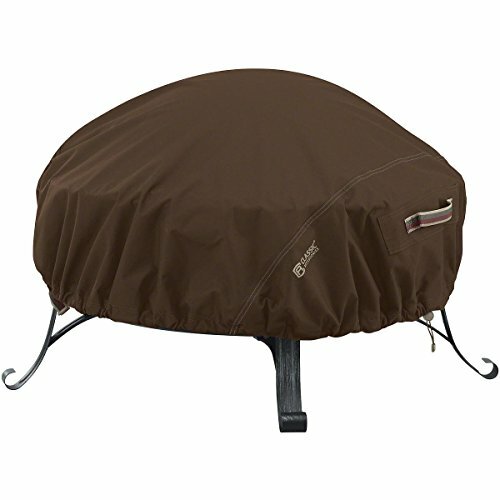 Specifications: Fits Round fire pits up to: 60" Dia. x 12" (H). If you have any questions about this product by New Classic Accessories, contact us by completing and submitting the form below. If you are looking for a specif part number, please include it with your message.